adidas today revealed the shortlist for the adidas Golden Ball award for the 10 best players at this summer's 2014 FIFA World Cup Brazil™. The award, sponsored by adidas since its inception in 1982, goes to the tournament's best player and will be chosen by the FIFA Technical Study Group (TSG) with the winner set to be announced at the final during the trophy ceremony. Ángel Di Maria – Following on from his fantastic season with Real Madrid, Di Maria has become a key figure in the Argentina team. In his new midfield role, he has attacked with pace and has had 21 shots on target. He scored the decisive last minute winner against Switzerland to prevent penalties. Mats Hummels – Hummels has been one of the best central defenders of the FIFA World Cup, displaying strength and speed and forming a formidable partnership with Jerome Boateng. He scored the decisive goal in the 1-0 quarter-final victory over France, and has been described as a 'German Machine'. Toni Kroos – Kroos has proved he is one of the best midfielders in the world here in Brazil. He operates the engine room for the Germans, dictating play with an 85% pass completion rate, assisting four goals as well as scoring two in their amazing semi-final victory. Philipp Lahm – Arguably the most consistent defender in world football, Lahm has been used in his traditional right back role as well as central midfield. He has been essential to Germany keeping three clean sheets, playing every minute of their FIFA World Cup campaign. He has been productive in attack too, providing two assists. Javier Mascherano – Mascherano has anchored the Argentinian midfield with real class during the tournament and won his 100th cap in Brazil. He has played over 600 minutes, and completed 478 passes, the most of any player. His last ditch tackle against Arjen Robben in the semi-final demonstrated just how instrumental he has been in Argentina's passage to the final. Leo Messi – Continuing his sparkling form, Messi has won four Man of the Match awards, scored four goals and assisted Angel Di Maria's winner against Switzerland. He has produced when the pressure has really been on, leading Argentina into the Final and affirming his status as a legend of the game. Thomas Müller – Müller had a sensational FIFA World Cup in 2010 and has been just as good this time round with five goals and three assists. He scored a fantastic hat-trick against Portugal, as well as goals against the USA and Brazil. His versatility is vital for Germany and has given defenders nightmares. Neymar Jr – Up to his injury, Brazil's golden-boy had a great tournament, helping Brazil out of the group and all the way to the semi-finals. Cool in front of goal with a wide range of skills, he has lived up to his reputation. Arjen Robben – Flying down the wings, Robben excelled as The Netherlands made it into the semi-finals and scored three important goals. He set the record for the fastest dribble speed on the pitch and has produced the most solo runs into the opposition area with 17. Robben was instrumental his team's stunning opening performance against Spain. James Rodriguez – Arguably the revelation of the FIFA World Cup, Rodriguez dazzled defences and crowds with his skill, eye for a pass and fearsome shots. He scored six goals, including one of the goals of the tournament against Uruguay, to take Colombia through to the quarter-finals. The shortlist was exclusively revealed by the FIFA World Cup ball's Twitter account @brazuca, marking the first time that the shortlist has been announced on social media. The @brazuca handle has entertained fans throughout the tournament reaching over 3 million followers and tweeting throughout the 2014 FIFA World Cup in both English and Portuguese. 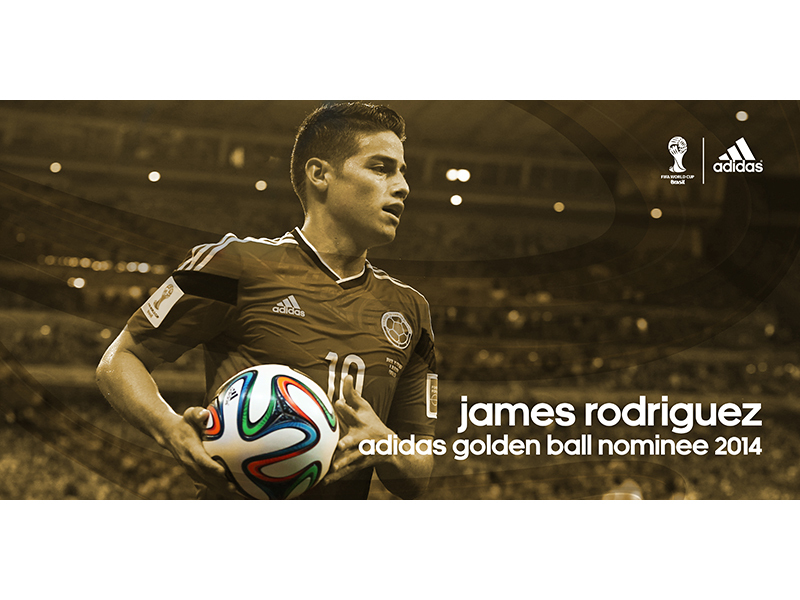 The adidas Golden Ball award has been presented to the most outstanding player at each FIFA World Cup since 1982. The inaugural winner was Paulo Rossi after he guided Italy to victory while famous names such as Diego Maradona, Romário, Ronaldo and Oliver Kahn have also won the coveted award. Most recently, Uruguay's Diego Forlan won the Golden Ball award in 2010, after scoring five goals in South Africa. The players who finish second and third will receive the adidas Silver Ball and Bronze Ball respectively. Recent recipients of these awards include David Villa, Fabio Cannavaro, Davor Suker and Hristo Stoichkov.